Throughout this site, you will find different types of 360° medias. Some has been created with a standard definition while others have higher definition, allowing you to zoom in the image in order to reveal surprising details. Many of the images are compatible with virtual reality goggles. If you have one of the simple Google cardboard or more sophisticated ones like Oculus Rift, Samsung Gear VR, immersion is just spectacular. These images are part of the category Virtual Reality. At any time, you can control the rotation of the panorama (photo or video). On a tablet or a phone, move your finger on the screen to point the camera wherever you want. Use the other “gestures” to zoom in or out. You use a mouse? Click and drag your cursor over the image. Also use the control icons at the bottom of each window displaying a panorama. 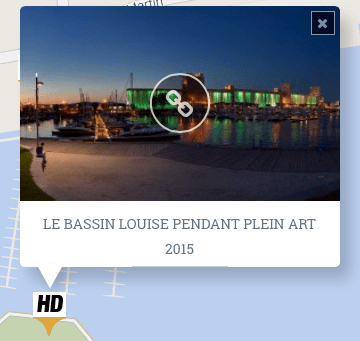 To show or hide the Google map, click on the tab Map. This markers display the location of the images displayed on the page. Use the icons on the tab to manage the size of the card. The “ALL” icon lets you see all the 360 videos, standard video and 360 ° panoramas in standard definition and high definition (HD). Each medium is represented on the map by a pointer. 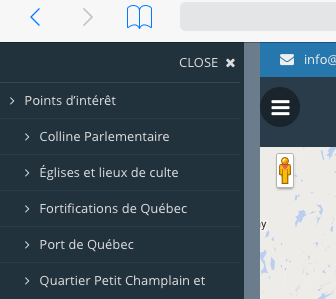 Some pointers start a virtual tour with more then one panorama as for celebrations of New France. Here are the different types of markers. Click on a marker and a thumbnail of the media appears. You can either click on the thumbnail or the title to access the interactive media. 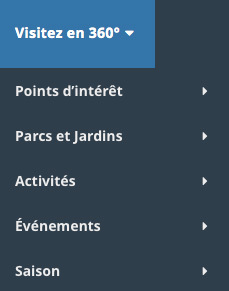 Select the category from the Visit 360 ° Menu. The corresponding views and videos to this category will then be displayed on the page. Open your menu by clicking the icon burger Select a category. The corresponding views and videos to this category will then be displayed on the page. You can also use the Categories list to the right pages to browse by topic. If you are looking a media on your smart phone and you see the VR Goggles icon it’s because this media is compatible with VR goggles.